Photographed by Nicole Bentley, styled by Kate Darvill, Vogue Australia, May 2018. Kylie Minogue is dancing on a bed in a Schiaparelli mini-dress. She launches herself high into the air, as if leaping from a trampoline, kicking her legs up behind her. Her long blonde hair flings across her face, which is filled with absolute childlike joy, eyes closed, a grin from ear to ear. For a moment she resembles the pre-tween Kylie who used to play elastics and run free under the sprinklers with her sister Dannii in the backyard of the Minogue family home in suburban Melbourne in the 1970s. But this is Kylie on the cusp of 50, an international superstar, dancing, carefree, healthy and happy. Minogue is entering her next decade with a new lease on life. The past 18 months for Australia’s pop princess was turbulent, marked significantly by a very public broken engagement to British actor Joshua Sasse that she initially refused to admit was a problem – the “troubs”, as she refers to it, her eyes steely as she brings up her troubled love life, which led to an emotional breakdown and her losing her voice and retreating into the freedom of songwriting in the sanctity of Nashville. But as she reaches her milestone birthday this month, with a new album, a new sound and new happiness, she’s achieved closure with the break-up, celebrated 12 years being free from cancer, marked 30 years in the music industry, made a successful return to acting, and is even accepting the idea of looming menopause: Minogue is embracing a “no troubs” 2018. Minogue finishes her herbal brew and pours us both another. She prefers classic “robust builder’s tea” – a sign she is a true Londoner after three decades living in England – but there isn’t any to hand. I notice she’s taken her The Row slides off under the table and while moments ago she seemed so tiny – she is only five foot tall, and the loose-fitting cornflower-blue Viktoria & Woods pantsuit she is wearing drapes her petite frame – the longer we talk, and the more Minogue, or “Min” as she calls herself, opens up about her extraordinary life, the bigger she becomes. She is confident, funny, charming. Self-deprecating, even. (“That’s like the glossy version of me, not the bogan-at-home-wearing-Uggs-or-thongs version” she amusingly reveals at one point.) And surprisingly honest. She is a fighter who bounces back time and again, whether it be over issues of love, health or her position in the ever-fickle music industry. Resilience springs to mind. I ask if she would describe herself as resilient, and she says she is like a pony at the gate – a somewhat feisty, optimistic pony. “Yes, I think I am, I mean, I’m sensitive, but I’m resilient, and that makes me a contradiction in many, many ways,” she laughs and rolls her eyes. “I drive myself crazy. I’m a Gemini: yes, no, yes, no, yes, no, both! I’ll say one thing, and then ‘on the other hand …’ But I’m pretty pragmatic as well. What else are you going to do? I guess I’ve been lucky. I’ve always had opportunity in my life. I’ve never really felt like all the doors are closed. I don’t really know what I mean by that. It’s not necessarily a career thing. It’s just how I was raised; it is my lot in life. I’m still trying to figure out the pony analogy as Minogue continues. “Crystal [her hairdresser, Christopher] says I’m like a theme park: it’s open, all the rides are going, everything’s going, and when it’s shut, it’s shut. There’s no in-between. But the pony analogy is: just don’t shut the gate. If you shut the gate, I’m going to go wild. I will kick up a real stink. But if you leave the gate open, I’m not going to leave. It’s a mental thing, knowing that there’s a freedom. I like that there’s the option. 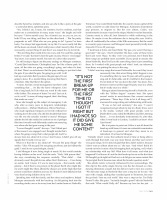 Since she brought up the subject of monogamy, I ask why, after so many years in long-term relationships with partners – Michael Hutchence, Olivier Martinez – who made significant impacts on her life without her walking down the aisle, why did she decided that Sasse was the one she actually wanted to marry? Minogue admits she felt she needed to conform to see if perhaps this time it would work differently; maybe not marrying was where she had gone wrong in the past. Spending time with her family, and her nieces and nephews, helped Minogue enormously with her break-up. As did getting back into the recording studio, one as far away from her London home as Nashville, Tennessee. You would think Nashville, the country-music capital of the world, would be an odd choice for Minogue, Australia’s chameleonic pop princess, to migrate to. But her new album, Golden, was transformative in many ways for the singer. Maybe it was her heartache. Country music is, after all, best listened to while wallowing in the blues. Or maybe it was the milestone she is facing this year. Gold is, after all, traditionally the colour of the 50th anniversary. But the result is a country-pop crossover, and Minogue’s most personal lyrically since Impossible Princess 20 years ago. “I look back at lyrics and I just think: ‘My gee, you weren’t having a good day!’” she says. “And I remember the days, some of those lyrics that I just went: ‘Raaa.’ So they were very personal, but I think that these songs are probably more accessible. If you speak to anyone else about Nashville, they’ll tell you the same thing: there’s just something there. So I worked with great people and what I took, my takeaway from there, was putting the story in the song. Minogue adored immersing herself in Nashville, even with the “billion degree” summer heat. She spent several weeks in maxi-dresses (her current sartorial preference: “These days I like to let it all hang out!”), ensconced in songwriting and collaborating with locals. She is at pains to point out Golden is not all about the break-up with Sasse, it’s more an existential examination of break-ups in general and what they mean to an individual. Or at least to Minogue. Golden also marks Minogue’s return to Mushroom via BMG. Mushroom Group’s Michael Gudinski has known Minogue since she was a teenager on Neighbours, as she first dipped into pop music via Stock, Aitken and Waterman. Gudinski and his wife Sue are considered second family to Minogue, and he has been one of her biggest champions throughout her career – his company Frontier Touring has always been her promoter in Australia and New Zealand. In early December, Mushroom hosted a listening party for selected Australian media to introduce Minogue’s new music. It was a like a bizarre silent disco: dozens of critics sitting in a bar with earphones playing several exclusive tracks, initially a little surprised by the boot-scootin’ beat of Dancing, then slowly starting to shuffle their feet to the tunes, including the splendidly poignant driving ballad Radio On, and the disco classic Raining Glitter. An emotional Gudinski fist-pumped the air at one point. “Our girl is back home,” he said figuratively and literally as Minogue then made a surprise appearance and the energy in the room lifted 100 per cent. She had just flown in from holiday in Thailand fresh-faced, tanned and dressed in yet another maxi-dress, and the affection for her was obvious as seasoned journalists honed in to have a quick chat and their photo taken with her. Gudinski says the key to Minogue’s enduring success is her continued ability to reinvent herself and knack of surrounding herself with the right creative people. Minogue’s sister Dannii, herself a chart-topping star, says the family unit – mother Carol, father Ron and brother Brendan – are extremely tight-knit. They bonded like most Australian families over their “low-key” suburban childhood, including “daggy” family caravan trips driving from Melbourne to the Gold Coast with nothing but ‘I, spy’ for entertainment. “I remember Kylie was always into fashion. She loved it and she was sort of putting on characters and becoming characters, so I think that’s why she was initially drawn into those things,” recalls Dannii. “But I think now with the songs and the music videos and all of that I think she gets to create all these different worlds. I think she always liked being cool. She had to have certain things … but our best memories are the daggy stuff like playing under the sprinkler outside. I used to play a game with her called elastics … it was a lot of fun, a very low-key growing up. Dannii says her proudest moment with her older sister was when Minogue returned to performing after her cancer treatment in 2007, for her Showgirl tour, and asked Dannii to perform the duet Kids onstage at her homecoming concert in Melbourne. Back in Franque, our tea has gone cold and our time is almost up. Minogue puts her slides back on: “They’re The Row – I like a lot of what they do.” I mention her fashion connections and how, on a recent holiday to Portofino, I had the best langoustine I’ve ever eaten at an off-the-track seaside restaurant and, because I was Australian, the staff immediately showed me a photo of Minogue eating the same dish while at dinner with Domenico Dolce and Stefano Gabbana, who own a villa nearby. “Did you go to Da u Batti? Stop! I’m so happy for you! It’s the best thing,” she, says grinning at the memory of the exquisite dish. Fashion has been significant in Minogue’s working life and she’s forged long-term and often personal relationships with international designers. As well as holidaying with Dolce and Gabbana, Minogue is a muse to Jean Paul Gaultier, with whom she has collaborated with on tours and album covers, and she also took respite at the Biarritz holiday home of Karl Lagerfeld after her chemotherapy treatment in 2005. While Minogue has been delving into a country-themed wardrobe for her most recent stage performances, she says she is enjoying supporting newer labels, including Alice McCall and Ralph & Russo, for her various appearances. For someone who has had such an extraordinary career, which has included performing at the Sydney Olympics closing ceremony and being presented with an OBE by Prince Charles, the concept is bizarre. I ask Minogue what her highlight from the past three decades would be. Without a beat, she recalls: “I love the moment of first hearing Locomotion on the radio. There was a station called Eon FM, and Locomotion had been released, and there was a show called Top 8 at 8, so 8pm, but they were listener-voted songs, so it wasn’t the charts. And all of us were at home. At this time, we had the radio on, they were started at number eight, then seven, six, but the closer it got, the more dejected we became. Then they said: ‘We’ve got a new song in at number one … Locomotion, and we were just like: ‘Ahhh!’” She squeals and her face lights up like a schoolgirl again. That was 30 years ago, when Kylie was just 20. And what about now. How does she feel to be turning 50?